Cast: Maximilian Schell, Anthony Perkins, Robert Forster, Joseph Bottoms, Yvette Mimieux, Ernest Borgnine, Tom McLoughlin, Roddy McDowall, Slim Pickens. Humans have always wondered how far mankind can travel within the boundaries of space. What mysteries lie in the great abyss. One of the most popular mysteries concerning the universe is the phenomenon of Black Holes. What happens if you enter one? How do they come about in the first place? All these questions have been discussed over countless mathematical and scientific lectures – but nobody really truly knows the definitive answer. Well, Gary Nelson tries to throw in his own theory as to what happens in Disney’s: ‘The Black Hole’. I remember being lent the video of the film by a friend of mine eight years ago. 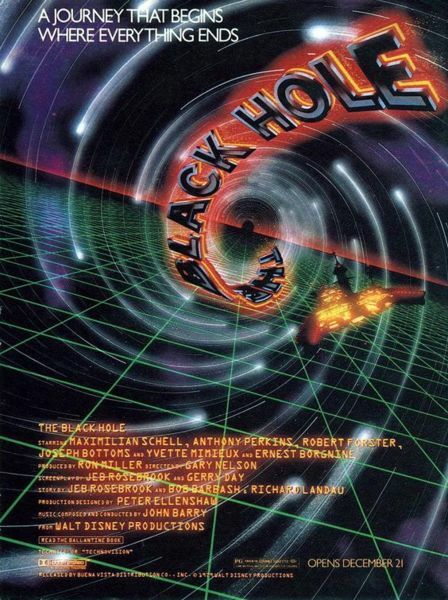 ‘The Black Hole’ should be noted for being one of the first ever films to use CGI rather than general animation, one of the first films to ever use a digital audio soundtrack and one of the first ever Disney films to be rated PG due to its ‘violence’. However, due to a poor Box Office rating – it still remains to this day – a forgotten treasure. The plotline is a basic cross between ‘Event Horizon’ (1997) and ‘The Cabinet Of Dr Caligari’ (1920). The crew of the Palimino find a deserted spaceship called the Cygnus on the brink of a Black Hole, and they investigate. They find a mad scientist on board called Dr Reinhart and his ‘devil shaped’ robot called Maximilian, who, not only hide a deadly secret onboard – but have the ultimate ambition to pilot the Cygnus into the Black Hole, all the way through and beyond. Even though it’s a relatively unknown film in most sci-fi circles – people still talk about it’s ending, which to this day is still being theorised. It’s largely reminiscent of the Gateway sequence ending from ‘2001: A Space Odyssey’ (1968). There are no words, just music and a whole lot of imagery in a hellish environment, leaving the viewer on a ‘What was that?‘ moment as the credits roll. Sheer brilliance in my opinon. The acting is quite stylish for it’s time, with people such as Ernest Borgnine and Anthony Perkins, (both popular household names within 1980’s film) taking major roles with such rich characters. The special effects are more or less the same as ‘Star Wars’ (1979), with your explosions and usual laser fire – but to top it off there’s a great bit involving a meteorite rolling down a corridor half-way through the film – that nearly kills a bunch of characters in a true Indiana Jones fashion. It’s quite mindblowing. This is one of my favourite films – and personally one that I think everyone should watch at least once. If you can’t be bothered to spend at least £10 for the DVD, I know for a fact that ’The Black Hole’ is one of those films which is still shown every Christmas or Bank Holiday, usually on Five.